Looking for Sloe Berries:How to find local Blackthorn and make Sloe Gin in 2019? Scroll down this page and follow the links. And if you bring home some fruit or vegetables and want to preserve, freeze, make jam, salsa or pickles, see this page for simple, reliable, illustrated preserving, freezing or bottling directions. There are plenty of other related resources, click on the resources dropdown above. 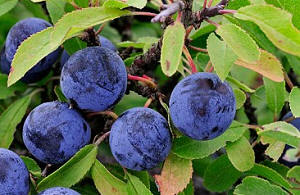 Most people know sloe berries only for their flavoring in "Sloe Gin". But the berries are also a type of wild plum, like damson plums, although they are extremely sour, too tart to be eaten fresh. . They are also known by another name; blackthorn berries, since they are the fruit of the blackthorn tree (Prunus spinosa), which is a thorny shrub. The berries also have a light pale coating, which can be wiped off with your thumb. The berries ripen after the first frost of winter (usually late October to early November in most of the UK). After picking them, sloe berries are traditionally pricked with a thorn taken from the blackthorn bush on which they grow. I'm told that these days most people simply pick the berries in August to October when they start to ripen (becoming a bit soft) and then freeze them, which accomplishes the same goals as pricking them.. If you cannot find sloe growing locally, you can buy it online. In the US, Amazon sells it on line here. In some years, Waitrose stores sell sloe berries. Beaulieu Estate in the New Forest used to grow them, they still may, and last heard, sold them for £4.99 for a 1lb punnet. Clean the berries and wash them in cold water. Either prick then berries or freeze them to help extract the flavor. Add 1/2 cup of berries and about 1/2 cup of sugar to 1 liter of gin. Let it age for 2 to 12 months, gently swirling the bottle from time to time. How long you let it age is personal preference, only time, experience and tasting will tell!